Jim suffers from Parkinson’s disease and chronic obstructive pulmonary disease, and is hard of hearing. His wife, Joyce, has previously suffered from lung cancer, a stroke and heart failure and currently suffers from angina, dizzy spells, is partially sighted and has a history of pneumonia.Despite both having complex medical needs, Joyce is the main carer for her husband with support from her daughter who lives locally. 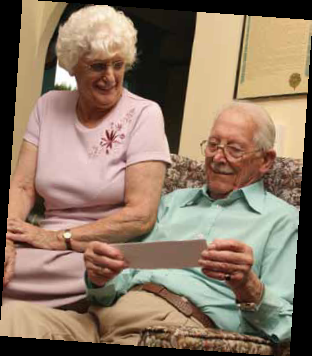 The Telecare Service became involved with the couple in November 2010. Jim and Joyce were feeling vulnerable and unsafe in their home due to their remote location and were concerned that Jim would not be able to hear a standard smoke alarm should he be in the property alone. Joyce reported that she was feeling frightened as her husband had fallen in the cellar and outside trying to get down the set of steps leading up to their property. The Telecare Service provided a pendant alarm to Jim, and installed two smoke detectors, a gas detector and a door alarm to provide reassurance should anyone try to access their property during the night. The gas detector is used to alert the couple if the gas fire is not ignited correctly or if there is any carbon monoxide in the property.